So what was the bird in Wednesday's photo? It didn't take long for it to be recognised for what it was, a coscoroba. The coscoroba Coscoroba coscoroba, photographed by Christopher Valentine at the Jardin des Plantes, Paris. Photographing this animal was not entirely easy: it was in the process of preening, and every time that we tried to get a photo, its head would dive back into its feathers and we'd have yet another photo of a headless coscoroba. The coscoroba (its name refers to the sound of its call) is a waterbird of coastward parts of southern South America, with its range having extended over the past century as far north as Uruguay (Kear 2005). In general appearance, it resembles a small swan (and is often called the 'coscoroba swan'). The most obvious difference between a swan and a coscoroba is that the latter lacks a bare patch of skin between its eyes and its beak. Coscorobas also have a flatter, more 'duck-like' beak than swans. Another significant difference can be seen in their behaviour: swans and geese are characterised by what is called a 'triumph ceremony', where a male approaches his partner (swans form life-long pair bonds), raising and lowering his head while calling, and is answered by her in kind. This behaviour is particularly common after the male has seen off a potential rival (hence the name), and probably serves to maintain the pair bond. Coscorobas, it seems, are far too refined for such brazen posturing, and limit themselves to a little quiet murmuring of their eponymous call (Johnsgard 1965). 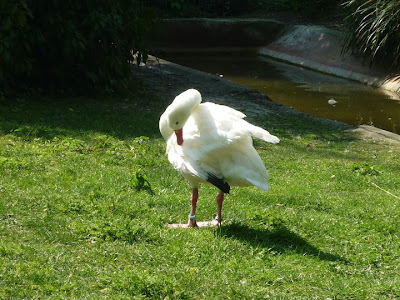 Because of its 'not-quite-swannish' nature, the coscoroba has often been seen as a link between swans and some other group of waterfowl, such as geese or whistling ducks. Molecular studies (e.g. Donne-Goussé et al. 2002) have placed it as sister to the Cape Barren goose Cereopsis novaehollandiae of Australia, with the two together sister to the swans. This does seem a little counter-intuitive, as superficially Cereopsis does not appear very coscoroba-like, but it is relatively well-supported. The purported similarities between the coscoroba and whistling ducks, on the other hand, are quite possibly plesiomorphies retained from the ancestral waterfowl. 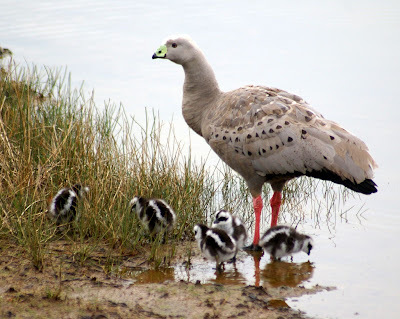 The Cape Barren goose Cereopsis novaehollandiae, potential sister to the coscoroba. Photographed by Norm Hanson. Donne-Goussé, C., V. Laudet & C. Hänni. 2002. A molecular phylogeny of Anseriformes based on mitochondrial DNA analysis. Molecular Phylogenetics and Evolution 23: 339-356. Johnsgard, P. 1965. Handbook of Waterfowl Behavior. University of Nebraska: Lincoln. Kear, J. 2005. Ducks, Geese and Swans. Oxford University Press. Regarding vernacular names; ideally, I (like many if not most other biologists) would prefer them to correspond as closely as possible with phylogeny. In this particular case, however, I have no real problem with keeping on calling the coscoroba a 'swan', even if it turns out not to be the sister taxon of Cygnus. Waterfowl referred to as 'geese' and 'ducks', respectively, are non-monophyletic assemblages to a far greater extent. (For example, neither the 'geese' Anseranas, Branta and Plectropterus on one hand, nor the 'ducks' Dendrocygna, Stictonetta and Anas on the other hand, are closely related to each other.) If I can live with that, I can live with 'coscoroba swan' too. Of course, being a vernacular name, you are perfectly entitled to call it whatever you wish ;-) . Personally, I simply prefer 'coscoroba' on its own because I think it sounds nicer and simpler than 'coscoroba swan'. It's like 'civet cat': it's not that it's wrong (vernacular pretty much by definition can't be wrong), it's just that the second part is unnecessary. Thanks for the correction, Rafael. Do you know if it breeds in Brazil?